Television has given in to the blood lust of its viewers. Violence tops the ratings. TV game shows now offer the ultimate in prizes: your life! Winning and losing has become kill or be killed. 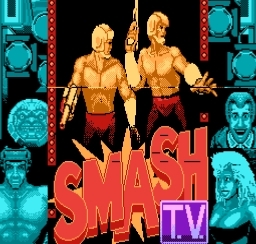 One show in particular stands as the biggest, most spectacular, most gruesome and most rewarding contest of all: SMASH TV. Alone or in a pair, powerfully armed contestants are sent into a closed arena. There, before a live studio audience and devoted TV viewers from around the globe, they battle opponents - human, humanoid, and inhuman - and search out the cash and prizes that will make them Smash TV Grand Champions. You are the next lucky contestant. --From the NES Smash TV instruction manual. You are a contestant on Smash TV, a violent contest where you must survive and arena, in which tons of beasts and killer robots enter the room from all sides, all with one goal, and that is to kill you. The purpose of the game is to shoot everything that comes towards you, and to try to grab as many prizes and cash that you see, while surviving in the Arena. Will you win or die on Smash TV? In this game, you must avoid getting hit by the people, who will beat you with a stick if they get too close. They will be coming from all sides. You will need to simply shoot them. While you are in fighting to survive in the arena, you can pick up objects to earn more points. Some will even give you a power up, such as a better weapon, or even protection stars (stars that rotate around you and kill any enemy that it touches).